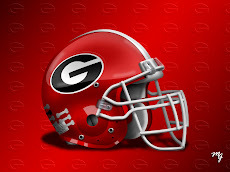 An Opinion On Sports: UGA VI: Damn Good Dawg!! UGA VI, the revered Churchillian English bulldog has died of congestive heart failure. 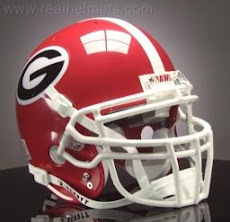 The ever popular mascot, registered as "UGA V's Whatchagot Loran? ", had served nine seasons roaming the Georgia sidelines, becoming the winningest Dawg of all his predecessors. During his herculean reign, his University of Georgia football teams compiled a record of 87 wins and 27 losses, including two SEC championships and a 7-2 bowl record. The previous record was held by UGA IV, who posted an impressive 77-24-4 record himself. The all white bulldogs have become a famous symbol of the University of Georgia, as well as one of the most famous icons in college football. They have worn tuxedos, been on the Senate floor, accompanied Herschel to New York to receive his Heisman, appeared in the movies, named the top mascot by Sports Illustrated, and lunged at an Auburn receiver who encroached on UGA V's territory! 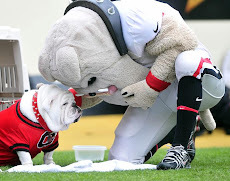 UGA VI was the biggest to serve as mascot, tipping the scales at 65 pounds, a good 20 pounds heavier than his father. This Dawg was no welterweight, in size nor character! The announcement of his successor will be forthcoming by the Seiler Family, the owners of the UGA lineage, and the University Athletic Association. Not to worry Bulldog Nation, that lineage is secure. Thanks for all the memories UGA VI. As we say in Georgia, "Damn Good Dawg!"